WordCamp is coming to Kansas City! Join the Unravel team at the annual WordCamp Kansas City conference on June 10-12, where we’ll enjoy a weekend focused on all things WordPress. WordPress updates, blogging, SEO, content distribution, business fundamentals, you name it—WordCamp’s got it and you’ll learn how to implement them all into your own business/WordPress development craft. WordCamp is the event for WordPress developers and users alike. As many as 300 people will gather together in Kansas City to explore, discover, and share WordPress insights, updates, implementations, business practices, and so much more. Get exclusive insight on how to manage 100+ WordPress installs from Unravel’s very own Scott Schaper on Saturday, June 11. Scott will address all the unique challenges associated with managing multiple WordPress installs, and how our Unravel team is mastering the Art of Process for our own clients. If you’re managing multiple WP installs, this is the talk for you. 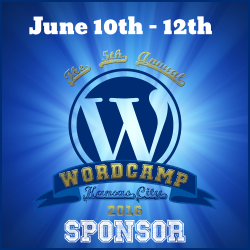 Unravel is proud to be a Gold Sponsor of WordCamp Kansas City 2016!